This my go-to recipe for a small loaf: it’s taken from Daniel Stevens’ Bread: the River Cottage Handbook, which I highly, highly recommend you get if you want to try your hand at making bread. It’s concise, flexible and offers enough detail to get you started, in addition to troubleshooting your bread. It also has recipes for extras like English muffins, tortillas, pitta breads and other types of bread if you want to go beyond the basic loaf, all of which come highly recommended. You can of course use other dried fruit (I’m planning on figs for Christmas bread, personally), or nuts, or anything that takes your fancy! Baker’s formula is as follows: Flour 100, Water 60, Yeast 1, Salt 2 (I’m not counting the raisins as that highly depends on taste). For the stretch and fold, see here. 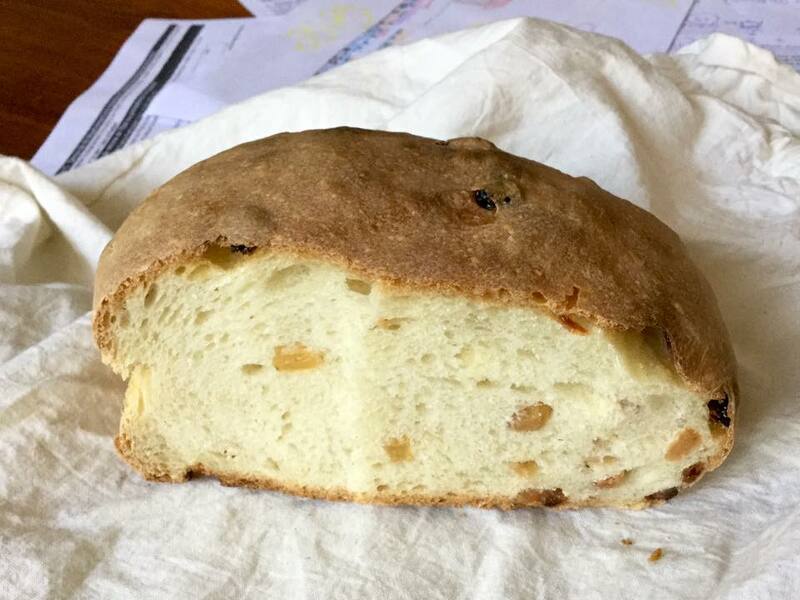 A lovely bread with raisins. Prepare the yeast: take 4 tablespoons of water at 37.5°C (either you have a thermometer, or if you don't, test by running the water against the inside of your wrist. It doesn't need to be precise to the degree, but there will be a difference between 25°C and 37.5°C, and more importantly anything beyond 50°C will start killing the yeast). Leave to rest for 15 minutes. In a large bowl, put the flour, and the salt, and mix well to scatter the salt. Reset the scale. Add the yeast-water mixture, and then top it up with water (it should amount to 152.5g of water). Mix by turning with one hand until the formation of a rough, clingy dough. If too wet, add flour, if too dry add water (you don't want the dough too dry, it'll come together as you knead! On the first go-around it's probably best not to add the extra water, but to do a first stretch-and-fold and see where that gets you with the dough). Do a first stretch-and-fold (see video in link above): take the dough, flatten it roughly, and stretch it to three times its size. Then fold it in three length-wise, and in three-height-wise. Gather it in a loose ball, flip it over the counter and cover with the bowl. Leave to rise for 10 minutes. Every 10 minutes do another stretch-and-fold, cover, and leave to rise. Repeat until you reach 4, or 5 (the dough should stretch enough to form a translucent window-pane if using refined flour). Flatten the dough, scatter a quarter of the raisins in, knead briefly to disperse. Repeat four times. Wash, dry and oil the bowl, then add the dough in it. Cover with cling film and leave to rise again, until doubled in size. De-gas by punching gently with the tip of your fingers. Then form into a ball again (see video), and put it on the baking sheet. Leave to proof for 20 to 45 minutes; dough should double in size and spring airily back when you squeeze the sides. Put the dough into the oven at mid-height (do it quickly or you'll lose temperature). Cook for 10 minutes. If after 10 minutes the crust is still pale, lower heat to 200°C. If it's browning, lower to 175°C. If's browning very quickly lower to 160°C. Leave to cook for another 30 minutes, then withdraw from oven. The loaf should sound hollow if you knock on the bottom, the crust should be brown. Leave it outside to cool for 1h. (if using fresh yeast, use 5g. If using instant yeast it's the same amount--to keep things simple, really it should be 1.6g or thereabouts, to account for instant yeast's higher capacity to rise--and there is no need to re-activate it in water beforehand).